Still not the Juliana. - Welcome to The City of Desire. I want to finish my holiday knitting before I go back to her. 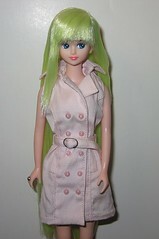 This dolly, a rerooted Takara-bako Hair Collection Lie, is another of Kristen's jobs. I had always wanted a doll with the rare lime-green saran, but we couldn't find a single doll it suited. I had originally wanted this girl to have red hair. In her original state, she had two-toned blond and red hair; the colors were nice but the fiber quality was awful. It was Kristen's idea to use this Lyme/Platinum White blend on her instead. I think she might have found the only doll in the world it looks good on!